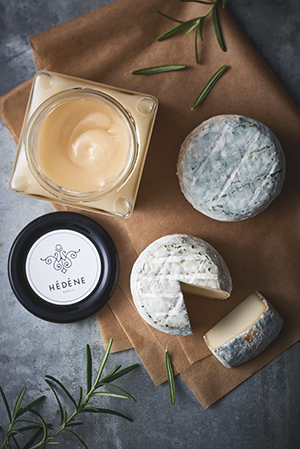 The reinforced partnership with cheese shops results from an exclusive collaboration with the Federation of French Cheese Makers and French Dairy Interbranch Organization. 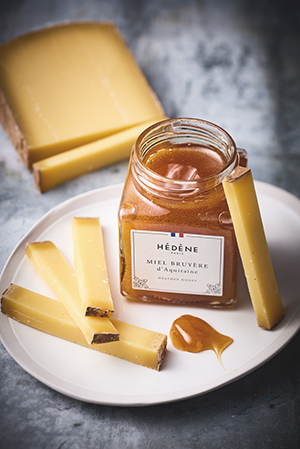 Introduced by various Best French Cheese makers, it gave birth to the most beautiful associations between Hédène honeys and cheese. 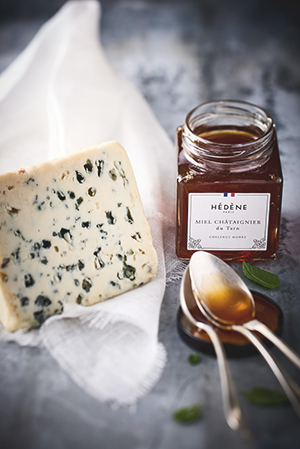 There are 10 associations between Hédène honeys and cheese with unique textures and flavors. You may also use easier recipes such as honey goat pizza, honey goat puff pastry or fresh salads with honey goat toasts for a meal with friends. A perfect match between two full-bodied products united in a sweet and sensual way, where both liquefy in the mouth. Chestnut honey first fade to cope with the roquefort’s strength, and then reappears to ease the marbling’s tingling, losing on the way most of its bitterness. The roquefort’s character is particularly enhanced. 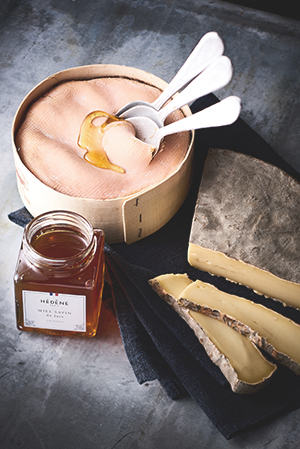 Exceptionally delicate and fruity, raspberry honey enhances the reblochon’s milky and buttered overtones. Regarding the textures, tasting is truly melting since the honey highlights the cheese melting texture. One more cheese: the pont l’évêque, which makes a very tasty ensemble with raspberry honey as each product accentuates the other’s smoothness. Really delicate in the mouth, with sweet milky overtones and a light goat character, brocciu distinguishes itself with a melting and aerated texture enhanced by acacia honey’s fluidity, refinement and crystal clear color. The ensemble is a genuine dessert, sweet and fresh, in which honey contrasts with the cheese’s bright and lightly acidulous flavor. The semi-mature crottin de Chavignol has woody aromas sweetened by rosemary honey in a refined and melty match. Almost campheric, the honey’s freshness contrasts with the cheese’s unctuous density and enhances its goat overtones. Regarding the textures, harmony is undeniable as both products are creamy. Alder buckthorn honey and ossau iraty make a melting and fruity association in which each product is enhanced by the other without any takeover. 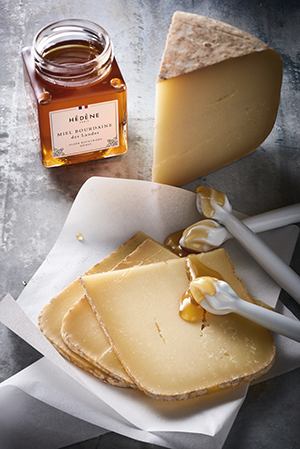 As this honey has delicate quince and spicy aromas, it is similar to the Spanish association between quince paste (carne de membrillo) and manchego, a cheese made with sheep milk too. The ensemble has a long-lasting taste. With an extra-old comté, ripened during three hours, this is an incredibly refined match. Heather honey’s solid chips burst in the mouth with the cheese’s tyrosine crystals. Dense and woody, the cheese changes in a salted caramel pastry on contact with heather honey. However, the association is more than a consensual sweetness, each protagonist has its own character. The textures, thin and creamy but still dense, line the palate and melt in a smooth and harmonious marriage. 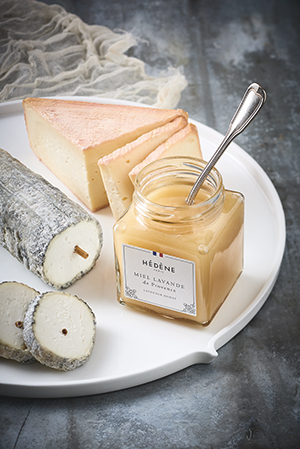 Lavender honey brings its floral notes to the saint-maure from Touraine, and the sweet almond scent establishes itself with delicacy, as if nut was inside cheese. The ensemble makes up a particularly refined taste with long-lasting aromas. With a creamy and lightly granular texture, this honey mixes rustic notes and acidulous sensations. 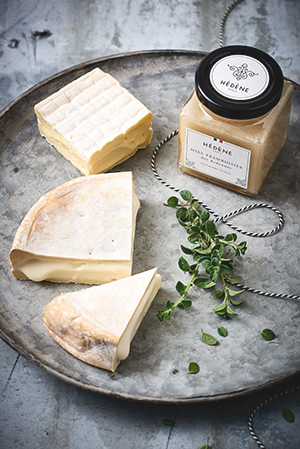 They enhance the brillat-savarin’s milky and buttered scents, as well as the mushroom aroma in an ode to wilderness. 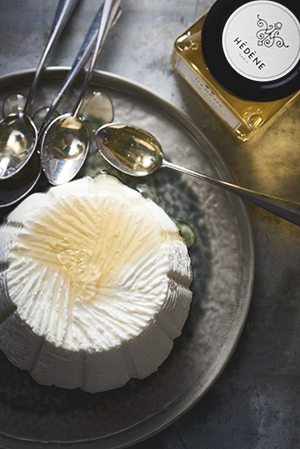 Denser than cheese, bramble honey reinforces paste’s melting smoothness. The brillat-savarin’s bounty galvanizes the feeling of eating bread with honey and (very good) butter. Creamy, wild and woody, mont d’or rises in this tone on tone match : similar textures melting in the mouth, when woody and resinous aromas (spruce for cheese, fir for honey) are in perfect harmony. However, tasting remains original : fir honey first dominates but then cheese comes back forcefully, with more intense aromas than when it is tasted alone. Milky and buttered overtones are particularly enhanced. 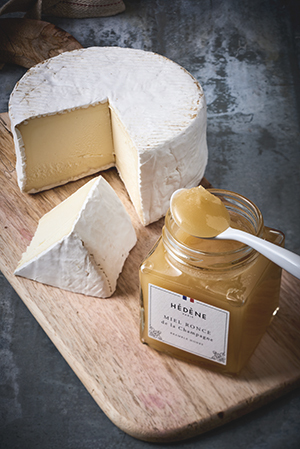 An explosive honey was a must to cope with the intense scents of well-matured brie. 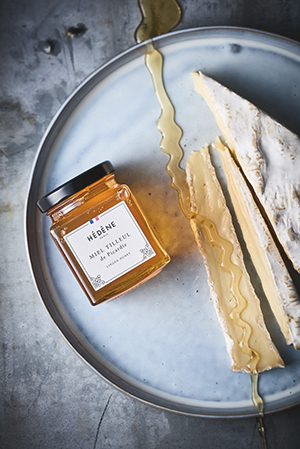 It is a bold match between close soils – Brie and Picardie-, in which Brie softens lightly linden honey’s intensity. Meanwhile the honey’s sweetness and freshness give a tasty touch to the cheese, which melting texture is particularly enhanced. None of the protagonists manages to take over.